ST. GEORGE – A two-vehicle collision in St. George Tuesday evening significantly damaged city property and the front yards of two residences. A woman was also injured in the crash, and her car was disabled. At 5:41 p.m., reports came in to the St. George Communications Center regarding a truck-versus-car accident on Dixie Downs Road. An older woman in a white Chrysler was pulling out of a 55-and-older community near 1300 North and Dixie Downs Road when the accident occurred. “She said she was going straight across the road, and witnesses confirmed that,” St. George Police Lt. Joe Hartman said. “She pulled out in front of a work truck, a plumbing truck, that was going southbound in the inside lane,” Hartman went on to say. The Chrysler and the truck collided. “The impact caused the two vehicles to kind of spin off the road,” Hartman said. The two vehicles ended up a block apart, landing in the front yards of two different residences. The incoming vehicles caused damage to the yards of both homes, Hartman said – primarily to the landscaping. In one yard, the lawn, a tree and a sprinkler system were damaged, he said; in the second yard, there was damage to some shrubs and grass. 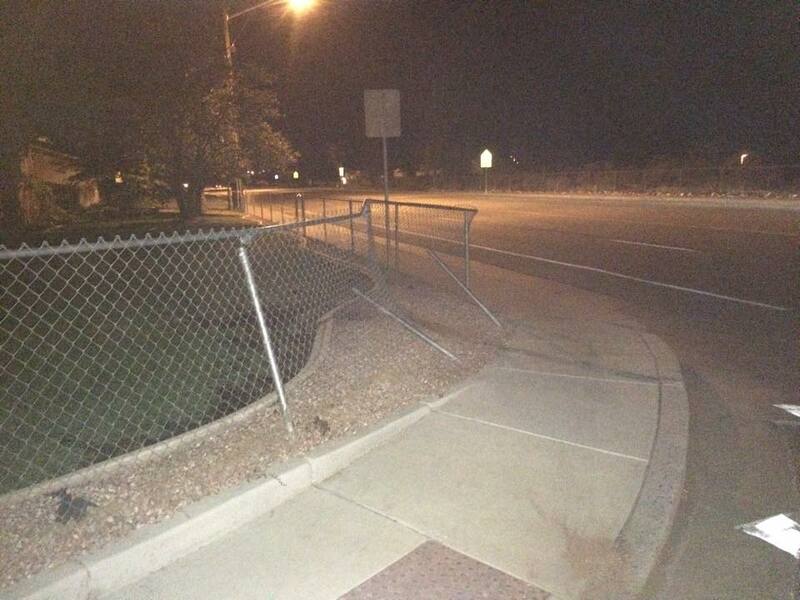 A chain-link fence was also damaged at one of the residences where it was impacted by one of the vehicles. 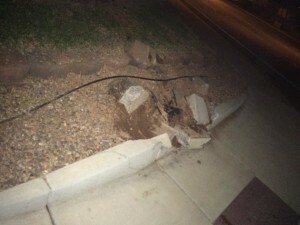 A city curb additionally took a hard hit as a result of the collision. 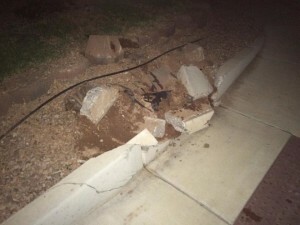 “There was a quite a bit of damage to this curb,” Hartman said. 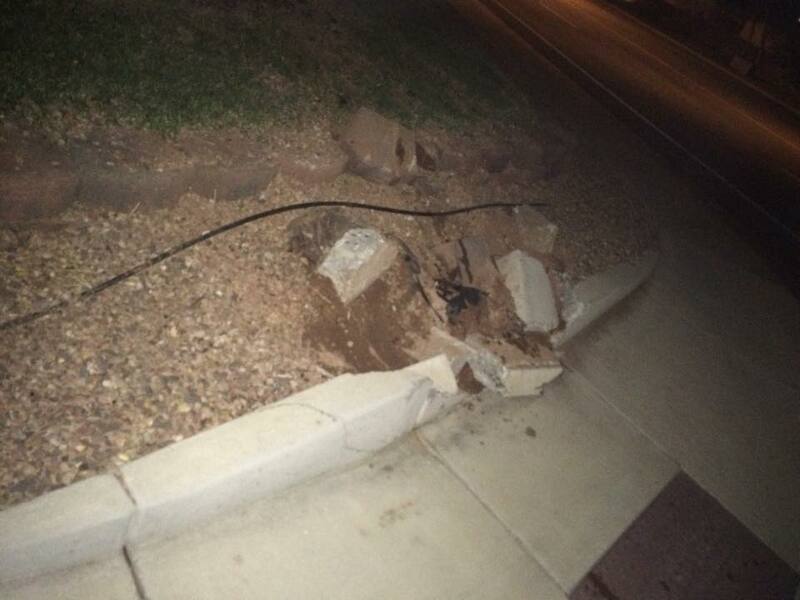 The damaged curb doesn’t pose a road hazard, he said, but officers reported it to the city so it can be repaired. Though the vehicles landed in residential yards and were not in the roadway, one lane of Dixie Downs Road was closed off for about an hour as responders attended to the accident. The woman in the Chrysler sustained injuries to her arm and foot, Hartman said, but she refused ambulance transport to the hospital. The man in the truck did not require ambulance transportation to the hospital. He was able to drive his truck from the scene, but the Chrysler had to be towed. Neither vehicle was carrying any passengers at the time of the accident. The woman in the Chrysler was cited for failure to yield. In addition to the St. George Police Department, the St. George Fire Department and Gold Cross Ambulance responded to the accident scene.